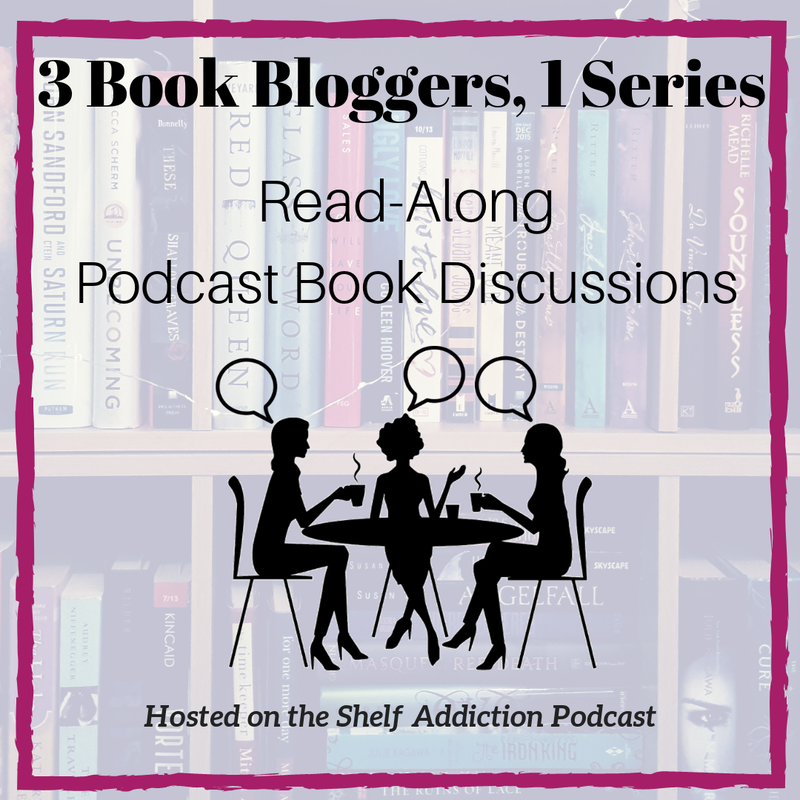 Figuring out when to end a series has got to be challenging for a popular author. As a fan, it’s a conundrum too, because when you’re in love with a world, whether it’s historical, paranormal, or almost-real fiction, it’s hard to give it up, even when you know it’s time. And yet a good author knows when to leave them wanting more, because really, there are only so many times that any given character can Save The World. I’m very pleased to report that Naamah's Kiss delivers everything a Terre d’Ange fan could want. Carey returns to a feminine viewpoint, telling the story of Moirin, a descendant of the “bear witches,” the clan who betrayed Imriel in the second trilogy. Several generations have passed, and the larger magic abilities of Moirin’s people have faded, similar to legends you might read about the Fae. One of the aspects I like the most about all of Carey’s books, including Santa Olivia , is the way the point of view character always sees themselves as more or less ordinary, and tells us their extraordinary story with such a sense of humbleness that you don’t always realize immediately that you as a reader are getting a front-row look at this world’s history unfolding from inside the eyes of someone who is going to turn out to be a pivotal figure within the world. At one time, Moirin’s internal narrative tells us that “whatever else happened, we had just ridden into legend.”* And damn if that doesn’t feel like the dead truth when you’re reading it. Something I always appreciate about the Terre d’Ange books is the way sexuality is treated: from sacred to ordinary, it’s a part of life--and a part of the story-- that is just as accepted any other part of life. And just to prove that I do retain [some] of the stuff I’ve learned along the way since starting this blog, let me comment that if you find a heteronormative framework restrictive and unsatisfying, you won’t have a problem with Terre d’Ange. As with the previous trilogies, the “love as thou wilt” theology of Terre d’Ange is an underlying force in Moirin’s destiny; her partners and lovers all have a role in leading her along her journey and the book falls into natural phases along with her different affairs. All up, I give Naamah’s Kiss a whole-hearted recommendation for any fan of good fiction. If high fantasy hasn’t been your cup of tea thus far, Carey just might be your gateway book. If you love historical fiction, heroic legend, or just plain good storytelling, Carey does not disappoint. Romance purists will not find a story centered around a couple's relationship, but there are lots of romantic elements. 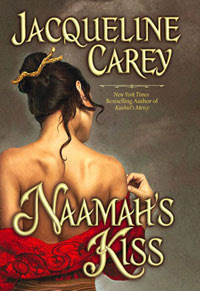 If you’re already a fan of Ms. Carey, rest assured that Naamah's Kiss delivers. For now, I think I like it even a little better than the Imriel trilogy – perhaps it’s something about the female protagonist that works a little better for me. And….. it’s a Hachette book. And you know what that means. I have 5 copies to give away. June 24th is the release date, so I will announce all 5 winners on that day (though if you want it sooner, it looks like Amazon is already shipping them). Check back between now and then and you may get more chances to enter. For now, comment below to start your chances, and post a link on your blog, Facebook, etc. for a second entry. Please specify if you live outside of North America – if I get international submissions I will set aside those participants for one of the 5 drawings. *Note: the quote is from an uncorrected review copy; it may not appear in the published edition as I've shown it here. Hm, I've only read the first Terre d'Ange book, and I enjoyed it although it's definitely an incredibly meaty book and one that develops slowly. Don't enter me in the contest, I just wanted to say what a great review this is, Nicola! Hey Kati, can I have your entry then? I keed. I keed. Put me in for the drawing, please. I'm so excited about this book! Love this series. Thanks for the review, and a chance to win a copy of the book! Good review, definitely want to read this book, whether I win it or not, thanks for the chance! Eeeeeeeee! I can't wait. Love her so much. Great review! I would love to read this book since I just started reading this series and I couldn't put it down. After such a glowing review this book has become a must read. I'm in the middle of Kushiel's Chosen right now. I'm glad I took your recommendation on these books -- they're richly detailed and very satisfying. Thank you! 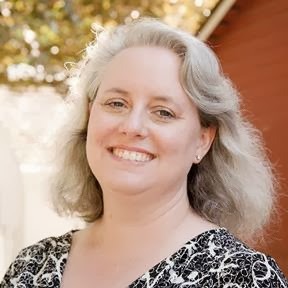 New author for me, thanks for entering me in this giveaway! I've been wanting to read this book forever. Please count me in. I've posted this on my sideblog. I'll post this on my Twitter. But the site is down so it might take awhile. Thanks again! Okay, I never win these things, but for now the odds seem pretty good, and I love Jacqueline Carey's books, so count me in for the drawing. Please count me in for the drawing. This is a great series and I'm excited about this book! I adore this series! Thank you so much for sharing the book wealth. The cover is beautiful. I'd love a chance to win. I have been dipping my toes into dark fantasy and paranormal recently, and generally been glad I did. So I'm not totally unfamiliar with territory - but I am unfamiliar with Carey's work. I had avoided the Kushiel books due to impression that there is a signficant amount of violence involved, and I've found I need to be careful of that type of content (don't read suspense /thrillers/horror for that reason). Perhaps I should give this title a try? (I'm in Canada, in case that's relevant). I would love to be entered. I want to get my hands on a copy of this book. Hmmm, M., not sure what your thresh-hold is. I wouldn't have called the Kushiel books overly violent (with the possible exception of Avatar), although there were battle scenes in most of them. Naamah's Kiss does have an extended battle scene that gets a bit gory... but I can't think of anything else that might be an issue. LMK if you still want to be entered in the drawing, otherwise I will assume not. Great review. Thanks for the chance to win! I should mention that i live in France , if that's ok for the contest? I've never heard of this series, but it looks interesting. Don't enter me in this contest, I just wanted to say that that was a really good review! I never get tired of looking at this cover or seeing it all over blogland =) I'd love a chance to win a copy!! I also posted a link to this contest on my sidebar! These books are being shipped directly from the publisher who limits to North America. HOWEVER, what I will do is put all the international entries into the drawing for the last book, and if I draw an international name, I will cover the shipping myself. If you're the only one I'll just let it play out normally :) but I don't want to commit to covering international shipping for more than one copy. Does that make sense? I've never read any of Jacqueline Carey's books & this one looks like a great place to start. for some reason I developed the impression that the Kushiel books involved some form of sexual violence. No? Wrong impression? If so, I stand corrected, and should take a closer look at the series because so many people talk about it in superlatives. I don't really have a problem with battle scenes (so long as they don't go on for multiple chapters, but that's more of a boredome issue) so I'll live dangerously and ask to keep my hat in the ring! Great review and I can't wait to read the book! I'm also a Carey fan although I'm shamefully behind in reading her. I have Kushiel's Dart in my TBR and I'll probably read it this Summer. After seeing so many interesting reviews about Naamah's Kiss, I'm really curious to read it too. This book sounds great. Enter me please! I'm very excited about this book... sign me up for a chance to win! And thank you. So excited about this one, please sign me up! Great review. By far one of my most favourite authors. And I agree, that while I wish to see more of Phedre.. I wouldn't want it to be to the point where it gets "tired". So seeing this great world in other ways at least keeps the "world" alive. I would like to enter. I am a new follower of your blog. I've also advertised your giveaway on my Twitter, so put me down for another entry! And thank you again. I love love love the Kushiel series, each one of them and I've been waiting eagerly for this one. To whet my anticipation a bit, I actually googled to read a review of this book, which is how I came across your blog. Anyway, would love to be entered in the drawing. Am from outside North America, by the way. Very intriguing, please enter me, thanks!